Which is the tastiest kosher-for-Passover potato chip? The grocery store seasonal aisle is a refreshing bastion of predictability: Valentines’ Day chocolate, Halloween chocolate, and Christmas chocolate come to mind. In some parts of the country (I live in the northern Chicago suburbs for example), a portion of the seasonal aisle is reserved for other less chocolate-driven occasions, such as Passover. On a recent trip, aside from seeing more traditional Jewish cuisine like beets, matzah, and matzo ball soup, I noticed a lot of potato chips. Furthermore, the bags and brands were different from the staples of the salty snack aisle. I thought normal potato chips were kosher? What’s the reason for the difference? A gentile noob like me didn’t understand that kosher-for-Passover is not the same as a year-round kosher certification. With kosher-for-Passover, the normal kosher rules apply, with the addition of avoiding certain grains or food that swells during the cooking process. This includes corn and legumes, which means no corn or peanut oil for frying. It’s starting to make sense. So the kosher-for-Passover chips adhere to a different cooking process. Do they taste good? Are they any different than traditional chips? The Takeout tested a few to find out. Any company that makes blackberry wine and chicken broth should have chips in its portfolio. Fried in cottonseed oil, these chips had a starchy, potato-ey taste. I suspect they were cooked at a lower temperature because of their rigidity. And they needed a little more salt. These were sturdy chips that could handle a thicker dip. They had a pleasant golden brown color typically unseen in traditional chips. I’d buy them again if they were on sale. These Lays’ chips are a product of Israel, using palm oil and “vegetable fats” in their Passover variety. Overall, I’d rank these ahead of the ubiquitous “Yellow Bag” Lays original chips. Like Manischewitz, these had a pleasant potato flavor, almost homemade. Each chip was a bright margarine-like yellow. The salt was sufficient, and certainly less than the bucket of salt that can overwhelm the “yellow bag” Lays. I liked these. 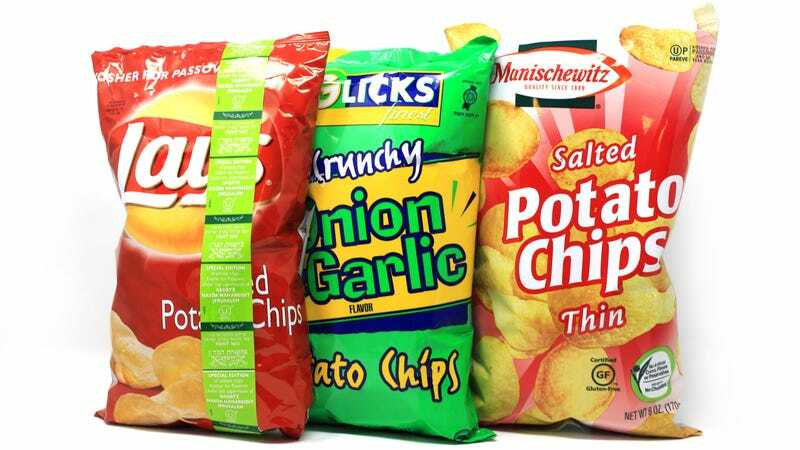 Similar to Manischewitz, Glick’s chips are just one of many kosher food offerings. Certainly crunchy, these were more wavy than ridges (think wide wale corduroy). Seasoning was not forgotten in the batch I had—there was an overwhelming onion taste, with the chips almost glowing orange from the powder. This is how I imagine onion bouillon tasting. Nevertheless, the chip was, crunchy, dip-worthy, and not stale-tasting at all. Just proceed with caution if you’re snacking before date night. Which non-alcoholic beer is marginally better than just drinking water? Are Wolfgang Puck’s canned soups Spago-worthy? Nick Leggin is a technology professional, writer, potato chip enthusiast, and former game show contestant.